I can never buy biscuits without eating the whole packet shortly after purchase and hence buying them to accompany anything other than one coffee session, is doomed to failure. If the packet does manage to make it back into the cupboard it is probably because they are boring and even then, the chances are they will be consumed within the day. You can expect your gluttony to be staunchly curbed with the Korean version of morning elevenses; sweet Potato and coffee make an excellent combination and one of my friends even dunks her spud in the brew. I prefer Maxim coffee mix but other varieties are probably just as good and I would imagine milk also provides a suitable accompaniment. 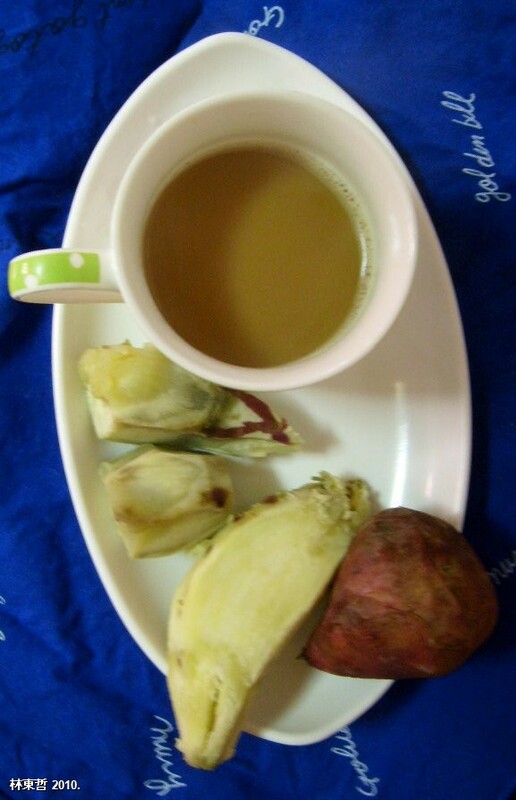 Simply microwave the potatoes, sprinkle with a little water and eat, hot or cold with intermittent sips of coffee. The potatoes don’t keep long and discolour quickly. Sweet potato can be a little dry so its combination with coffee produces some enjoyable textures. Incidentally, sweet potato eaten raw is also an interesting experience and has a highly nutty taste and a hard, crisp texture. Unlike biscuits, the chances are very high that your sweet potatoes will survive to last several morning coffee sessions. I’ve only been introduced to the many uses of sweet potato in the last year by my girlfriend. I’ve had some fantastic experiences with it – but never thought to have it as an accompaniment to coffee. Duly noted. Have you tried it raw? Quite an odd taste and texture but not unpleasant. Thanks.